1. Heat the rice in a large saucepan with the whole milk, coconut milk, 50g muscovado sugar and a pinch of salt, stirring occasionally, until boiling. Reduce the heat and simmer very gently, stirring often, for about 25 minutes, until thickened and the rice is just tender. Set aside for 5 minutes, then stir in the coconut yogurt. Cover the surface with clingfilm and chill for at least 2 hours, or for up to 2 days. 2. Using a sharp knife, remove the top, bottom and skin from the Supersweet pineapple. Cut into 8-12 wedges (depending on how many you’re serving). Discard the core from each wedge. Mix in a dish with the zest and juice of 1 lime, the rum and remaining 50g muscovado sugar. Cover and chill for at least 30 minutes, or for up to 12 hours, turning occasionally. 3. Heat a non-stick frying pan over a medium heat. Toast the coconut crunch (or desiccated coconut) for 1-2 minutes, stirring until golden. Remove to a dish. 4. Wipe any excess marinade from the pineapple, then add the wedges to the pan. Cook over a high heat for 1-2 minutes on each side, until caramelised. Pour over the reserved marinade and bubble for 2-3 minutes, turning the pineapple until softened and sticky. 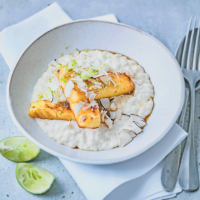 Serve with the cold rice pudding, scattering with the toasted coconut and more lime zest. Cut the remaining lime into wedges to serve alongside, with more brown sugar, if liked.